Cleanup Day organizer Abby Turner joins Sen. Ryan Gatti in cooking a meal for volunteers at the Lake Bistineau cleanup day Saturday. Lake Bistineau is a little more trash free following Saturday’s Cleanup Day, organized by Haughton High School senior Abby Turner. Turner has grown up on Lake Bistineau. She loves the lake’s serenity and its natural beauty. She also takes opportunities to duck hunt and fish and to just ride the lake and enjoy the scenery. But she noticed a trash problem while fishing on the lake one day. Bossier Parish seniors are required to complete an individual project before graduating. Abby’s family wasn’t surprised at all when she chose Lake Bistineau as the focus of her senior project. Abby’s cleanup event required a lot of effort. Under the mentorship of Bossier Parish Police Jury President Bob Brotherton, a retired educator, she organized volunteers, secured sponsors and created partnerships with government entities and organizations involved in management of the lake. “I’ve enjoyed this project from the beginning…the outcome is going to be worth our efforts,” Abby said. Volunteers gathered at three boat launches on the lake: Port O’ Bistineau, Gryce’s Camp and the Bossier Parish police jury’s public launch on Parish Camp Rd. 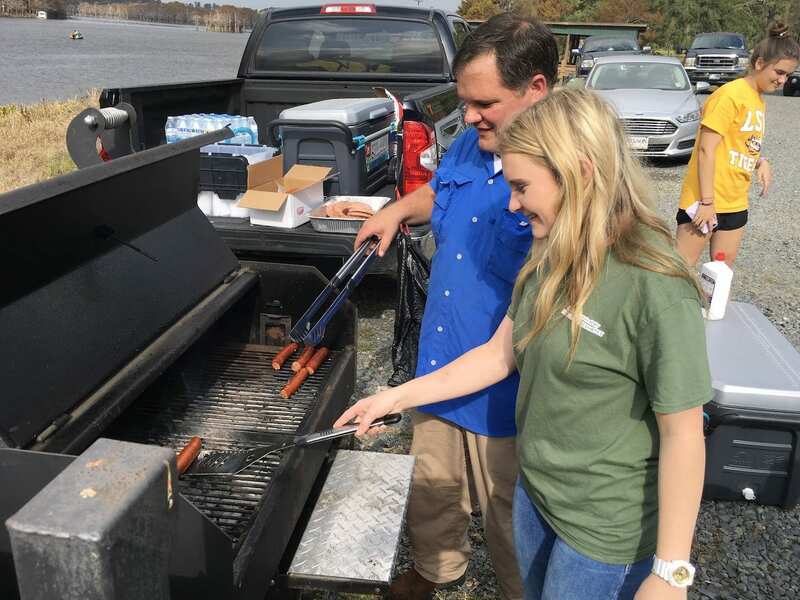 State Senator Ryan Gatti grilled sausage and burgers for volunteers at Port O’ Bistineau and also sponsored T-shirts featuring a cleanup logo for volunteers. Abby hopes this will become an annual event for the lake.